This is the game we dream/worry about all year! And for this first time instead of taking on UGA the second week of the season they have been pushed back into the heart of our schedule. This game not only carries the weight of the SEC East crown but could also end up having national championship implications. And the excitement surrounding this game has only increased with the arrival of ESPN’s College Gameday! The potential of this game is overwhelming even to the average fan but for those of us who live and breathe football it could quite literally go down as one of the greatest games we’ve ever seen! Florida’s running game has carried them throughout this season. With a mobile quarterback and running backs like Mike Gillislee that can leave most defensive backs in the dust, they are able to run the ball down your throat sideline to sideline. While they do not have the prototypical power back, their speed more than makes up for it. Quarterback Jeff Driskel has proven that he can throw the ball around but Florida’s passing game has been all but non-existent through the first half of the season. If the Gators can get their passing game going they could very likely make a strong run at the national title this year. The Gator’s defense is stingy and has done well at holding opposing offenses at bay after some issues early in the year. 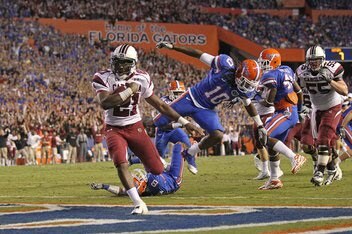 If they can follow a similar game plan as LSU did against the Gamecocks, by limiting the rushing yards and forcing Carolina to go to the passing game, they can avenge the loss they suffered the last time the Gamecocks visited the Swamp. After suffering a tough loss last week at LSU, the Gamecocks will look to right the ship on the national stage at the Swamp with College GameDay and CBS in tow. Carolina’s offense couldn’t get anything going against the Tigers tough defense and the course will not be much easier this week, especially in the passing game as the Gators have an outstanding secondary that creates turnovers. Despite his issues last week, Connor Shaw will be ready to play this week as we can be sure that he has had a lot of coaching this past week from the Ole Ball Coach. With the Gamecocks defense really banged up from injuries and a flu bug that’s being passed around, it will be vital for some of the back-up defensive linemen to play big against the strong Florida run game. Coach Spurrier said he expects some of those ailing from injuries and sickness to be back by Saturday but two big names are still very much in question: Marcus Lattimore and Jadeveon Clowney. With Lattimore potentially out, Kenny Miles is expected to get the bulk of the carries this weekend at the Swamp, and in his senior season there is no doubt that he is ready to shine. Miles came back for his senior season despite the presence of Lattimore and this is his time to take the team on his back and lead us to victory. With much of the defensive front out Devin Taylor will be expected to carry the load on the other side of the ball. Hopefully some young players will shine in their first real game action. UF: They must find a more balanced offense. USC: The backups must play key roles while filling in for their sick/injured counterparts. Post written by Gamecock Girl Sports Bloggess Lauren Hall.